The qualitative description of tumors feeling stiffer than surrounding normal tissue has been long appreciated in the clinical setting. These empirical observations have been corroborated by the precise measurement and characterization of mechanical properties of cancerous tissues. Much of the advancement in our understanding of mechanics in oncology has been enabled by the development of innovative technologies designed to probe cells and tissues as well as integrative software analysis tools that facilitate biological interpretation and generation of testable hypotheses. While some mechanics in oncology research has been investigator-initiated and supported by the National Cancer Institute (NCI), several NCI programs described herein have helped to foster the growth of the burgeoning field. Programs highlighted in this chapter include Innovative Molecular Analysis Technologies (IMAT), Physical Sciences–Oncology Network (PS-ON), Tumor Microenvironment Network (TMEN), Integrative Cancer Biology Program (ICBP), and the Cancer Systems Biology Consortium (CSBC). 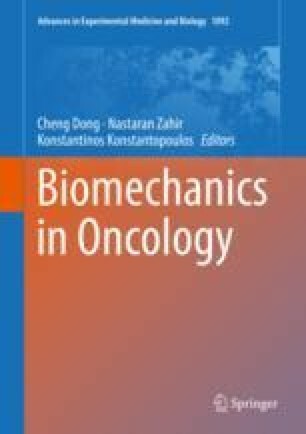 This chapter showcases the scientific contributions of these programs to the field of biomechanics in oncology.